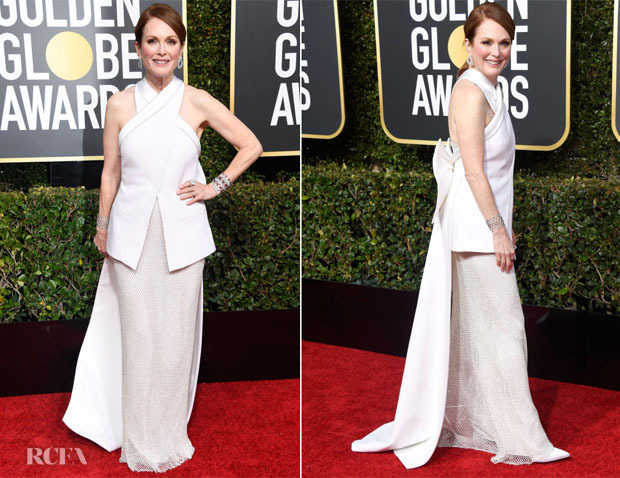 Julianne Moore graced the red carpet of the 2019 Golden Globes on Sunday (January 6) at The Beverly Hilton Hotel. The presenter donned a custom Givenchy Haute Couture dress. I feel a bit underwhelmed, possibly because I’m envisioning how Catherine Zeta-Jones’s green gown would look on her. The clean lines, brilliant white and mixed fabrics are in her wheelhouse, but I’m left wanting more — and not even the large bow detail on the reverse is doing it for me. Chopard jewels did provide some sparkle.